One of my colleagues, Kristen Lopez of Journeys in Classic Film, made a witty but truthful tweet about The Other Woman, the second episode of Feud: Bette and Joan. "This episode of Feud should have been called "Every woman wanted to screw Robert Aldrich". Oh, Ryan Murphy..."
We do seem to have a lot of women going after our schlubby journeyman director on this episode, but The Other Woman isn't about a mistress. It certainly isn't Feud creator Ryan Murphy working out his own sexual fantasies. It's about how insecurity and manipulation drove an unnecessary wedge between two women who looked like they were about to bury the hatchet. It lends a bit of tragedy to Feud, making us wonder what would have happened if they had been allowed to use their talents, rather than their bitterness, to create. Joan Crawford (Jessica Lange) finds a fan in a starlet (Kenzie Dalton) about to make her debut on What Ever Happened to Baby Jane? However, when the starlet makes the fatal mistake of saying that an autograph is for 'her grandmother' who has loved Crawford 'since she was a kid', it's enough to irk Crawford's vanity and insecurity about her director, Robert Aldrich (Alfred Molina). She convinces her costar/rival Bette Davis (Susan Sarandon) that the starlet has to go. Go she does, much to the delight of Crawford and Davis, who now are actually pretty chummy. Aldrich feels emasculated before the crew and rest of cast, determined to not let these two rule his film. Unwittingly eager to help is Warner Brothers head Jack Warner (Stanley Tucci) who wants Aldrich to play one off the other to make their hatred burn up the screen. Aldrich is a bit conflicted, especially when Aldrich's long-suffering wife makes it clear that manipulating them is a cruel act, especially when they're getting along. Aldrich's conflict ends quickly, when he feeds a false blind item to gossip columnist Hedda Hopper (Judy Davis), claiming Davis said Crawford uses falsies. The blind item both horrifies and enrages Crawford to where she interrupts a take of Davis' performance and threatens to drop out. Davis denies she said anything but thinks Crawford is going overboard in her Lady Innocent routine. To get back at Davis, Crawford deliberately says spiteful things about Davis to Hopper's rival, Louella Parsons. Now Davis is the one enraged, and secretly hit at a vulnerable point (her age). This is heightened when she sees her daughter B.D. Hyman (Kiernan Shipka) flirting with the crew. Crawford, for her part, attempts to seduce Aldrich and fails, and if she knew that Davis has managed to schtup Aldrich it probably would have sent her into fits. Crawford, however, is too busy playing Hopper, using her 'love' of the Hollywood community to bash the more aloof Davis, going so far as to not publish the fact that Crawford tells her she's $2 million in debt. The Other Woman gives us a tantalizing glimpse of what could have been: Joan Crawford and Bette Davis, if not buddy-buddies, at least able to see that they weren't the monsters the other imagined. As they observe the poor starlet walking away with her box, they see that united they are stronger. They even manage to giggle like girlfriends as they walk away, delighted that they have done something beneficial. It's a curious thing that The Other Woman shows a lot of 'women walking away with their boxes', for as we go into flashbacks about the rising and falling careers of Crawford and Davis, we see how their respective studios (MGM and Warners) pushed them out due to their insistence on better roles (much to the irritation of their bosses who hated the idea that women could order them). It's at this point that a strong argument could be made that Feud: Bette and Joan is not just about the notorious war between these two divas of the 'Golden Age of Hollywood'. It's also about the film industry which essentially hasn't changed since their time: how men are still the power either as the director or the executive, and how women of a certain age find their careers either stalling or falling when the next pretty young thing comes along. Granted, this may be reading more into things than is intended, but it is a subject worthy of consideration. The Other Woman shows that Davis and Crawford should have been allies, maybe even friends, because despite their own sense of importance (Davis, considering herself the actual actress, Crawford seeing herself as always a star) they were so terribly alike. They saw the power they had when they joined forces (a bit of 'the enemy of my enemy is my friend'), but how they were manipulated by a mixture of male ego and their own insecurities. I still am having a hard time accepting Lange as Crawford. It's not that she doesn't look like Crawford (the make-up department does wonders for her in that respect). It's just that I find Lange's Crawford voice so unlike my memories of what the actual Crawford sounded like. Lange sounds rather soft, almost whispery. However, her performance continues to be top-notch: Crawford's ego, vanity, and insecurity coming across so well. Sarandon looks and sounds more like Davis (though the voice isn't exact either, she gets Davis' take-no-prisoners speaking). She too does wonders, not just when playing Davis but when playing Baby Jane. Davis is just brilliant as the viper Hedda Hopper: with her notorious hats and faux-respectability, Davis brings out just how spiteful and vicious Hopper could be. She is the one who wants more than anyone (even Aldrich or Warner) to see these two battle-axes go at it for her own self-interest, but Davis also shows how easily a little tear and appeals to Hopper's sense of 'the industry' can be manipulated. 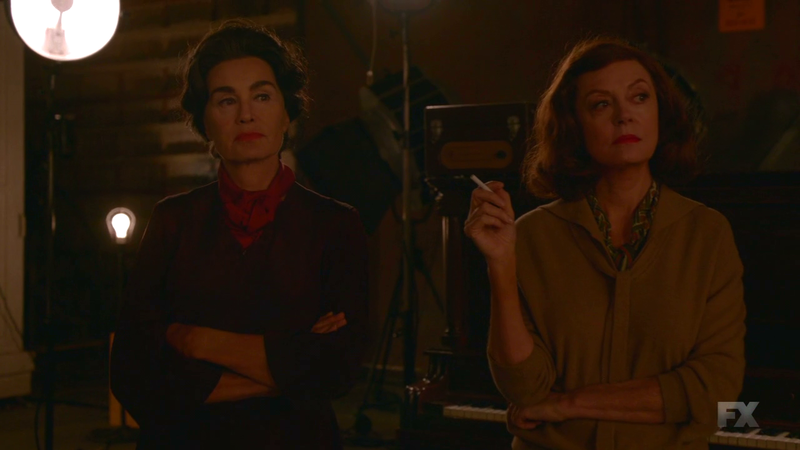 As sad it might be, it's the men who are dominating Bette and Joan. Molina is almost surely Emmy-bound for his performance as Aldrich: in his own way insecure, narcissistic, determined to do the right thing and constantly failing. Tucci is sleazy as Jack Warner, and in his one scene, Dominic Burgess brings a touch of comedy as What Ever Happened to Baby Jane? costar Victor Buono. Davis mistakes him for the catering crew and is horrified when she sees he will play her 'love interest'; with a mixture of innocence and knowing he tells her he's sure she wasn't expecting someone so fat and homosexual as he warfs down a donut. For once, Bette Davis is left speechless. Again, I don't quite get the framing device of the 1978 Academy Award interviews, though I'm willing to cut them some slack for a good payoff. We do see how 'Golden Age' stars are not keen on modern Hollywood: as Joan Blondell, Kathy Bates takes a swipe at Coming Home (that Vietnam War thing, she calls it). It doesn't help that Catherine Zeta-Jones neither looks or sounds like Olivia de Havilland (or that Feud hasn't announced as of yet they will feature her own notorious war with her sister, the late Joan Fontaine). Still, The Other Woman builds up our story while serving as allegory to the status of women and men in this whacked-out industry known as Hollywood. No La La Land frivolity here: it's all an ugly business of beautiful people.